During times of stress or anxiety, many people unconsciously clench their jaw, leading to tension, tightness and pain. A condition known as temporomandibular joint disorder, caused by teeth grinding -- usually while sleeping -- can also lead to pain and tension in your jaw. Performing specific stretches and exercises may help alleviate jaw tension and help you relax your jaw. The TMJ jaw stretch can help loosen and relax tight jaw muscles. Open your mouth as wide as you can, then slowly close it. Next, open your jaw and focus on opening up the left side of your mouth as wide as you can. Slowly close your mouth and repeat this stretch on the right side. You can repeat this exercise as often as you like whenever you experience jaw tension. The jaw resistance exercise helps to gently stretch the jaw muscles using resistance from your thumb. Place your thumb under your chin. Press your thumb upward against your chin to create a gentle resistance while you open your mouth halfway. Perform this exercise 10 times. This exercise stretches the sides of your jaw and relaxes the small jaw muscles. Close your mouth and place your right hand on the right side of your jaw. Try to push your jaw sideways into your hand. This is a gentle stretch -- you should not experience pain or discomfort. Perform this stretch on both sides of your mouth. The smile stretch helps alleviate jaw tension, opens your throat and relaxes your facial muscles. Smile a big smile. Open your jaw about two inches wide while smiling as wide as you can. Take a few deep breaths through your mouth, then relax your mouth and repeat the stretch a few more times. Self-massage is a beneficial method for alleviating jaw tension and tightness. According to author Dawn Groves, in her book "Massage for Busy People: Five Minutes to a More Relaxed Body," the jaw massage can help soften the muscles in your jaw and wake up your entire face. Clench your teeth to contract your jaw muscles. Using your fingertips, feel around for the contracted muscles in your jaw. 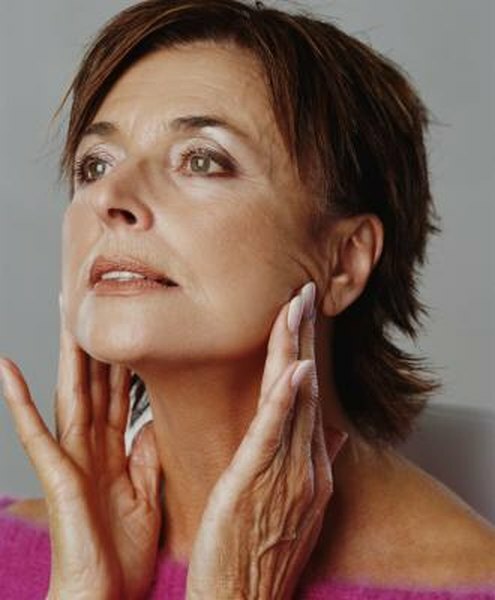 Massage your jaw using small, circular motions, working your way down the length of the muscles starting from the top and ending by your chin.